Friday night in Atlanta, which generally is not something one boasts about, is why the NBA regular season can be so special. 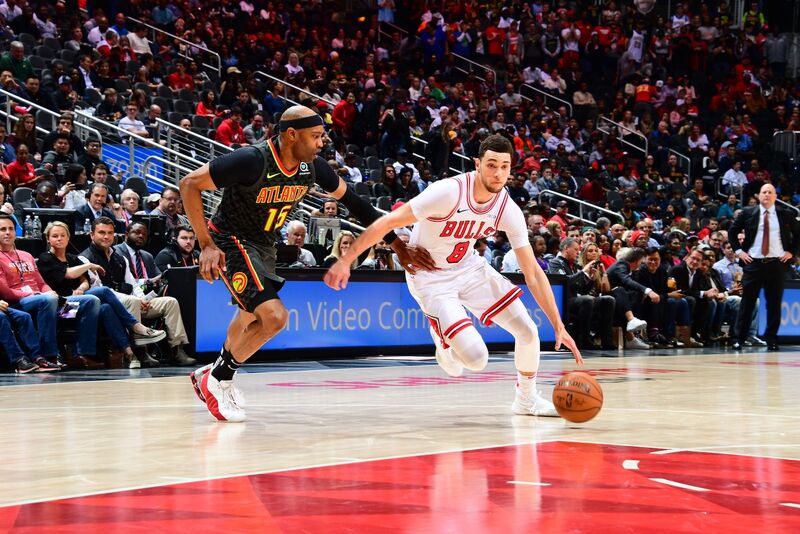 Not because of playoff implications or the draft lottery or individual accomplishment, though there were many as Zach LaVine scored a career high 47 points, Atlanta rookie Trae Young had 49 along with 16 assists, and the Bulls and Hawks played one of the most historic and high scoring games in NBA history, a 168-161 Bulls victory in four overtimes. Perhaps not the most artistic with the teams combining for 47 points off turnovers, neither team anywhere near playoff contention with six weeks left in the season and both gasping for air down the stretch with the Bulls Big Three of LaVine, Porter and Lauri Markkanen, the latter with 31 points and 16 rebounds, all playing more than 53 minutes. Young played just under 56 minutes and even 42-year-old Vince Carter played nearly 45 minutes while both teams combined to shoot 34 percent through the final three overtimes. But it was an epoch game crammed with records and memories. It was the third highest scoring game in NBA history, the most combined points scored in an NBA game in more than 30 years. The record for three pointers made was equalled and set for threes attempted, and the Bulls were a part of it despite being among the poorest offensive teams in the NBA for the last several years. It was a Bulls franchise record for points scored and points allowed and the 15th game of four overtimes in NBA history, two involving the Bulls in the last four years. Yes, these Bulls have come a long way, especially since the trade for Porter. Though 18-45, they’ve now won five of their last six games and are 6-2 when Porter plays, 6-3 overall since the trade of Bobby Portis and Jabari Parker and 4-1 since the All-Star break. Plus, it was just over a month ago when the Bulls were toward the end of a run of 14 losses in 15 games with perhaps the most embarrassing a 20-point home loss to the 21-42 Hawks, who seemed to be mocking the Bulls. No more as LaVine, Markkanen and Porter combined for 109 points. Three musketeers? Three amigos? Three Bears? It’s the Three Bulls! The power of three! It just shows that we’re resilient and that we’re together. We kept playing. I’m just glad we pulled it out. It was a good game. 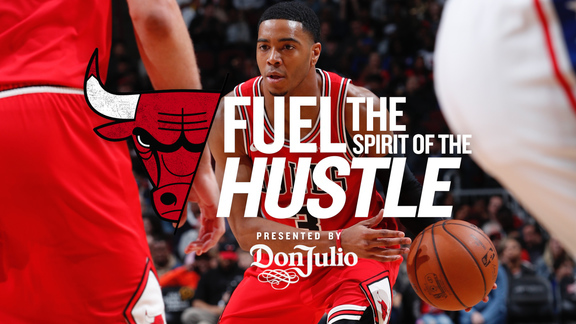 The Bulls also got 14 points from Kris Dunn, who fouled out in the first overtime, 13 off the bench from Shaquille Harrison, 11 points and 11 rebounds from Robin Lopez and 10 points from Ryan Arcidiacono, including a no hesitation three with 25.1 seconds left to send the game into a third overtime. “Obviously great game, classic type game,” agreed Bulls coach Jim Boylen. There was a cornucopia of highlights to nourish any hungry for the dramas of NBA life, moments of great accomplishment and woeful blunders. It had been a game the Bulls mostly controlled late even after a 12-0 Hawks run to close the first quarter gave Atlanta a 33-26 lead. The Hawks led 60-57 at halftime with Dunn and Harrison harassing Young into three of nine shooting and 10 first quarter points. 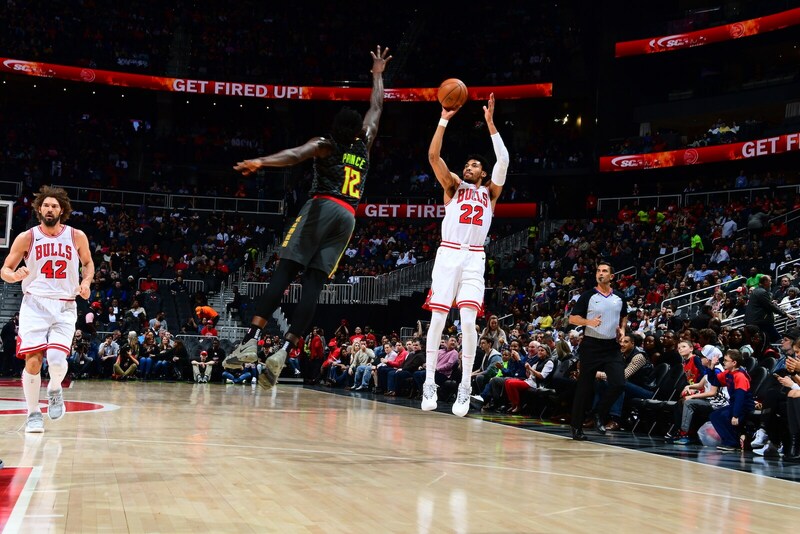 It looked like Bulls revenge from a January meeting when the Bulls led by 11 points from Markkanan hung a huge 38-point third quarter on Atlanta with a 13-2 closing spurt and 95-84 lead after three. It was quickly 13 early in the fourth and seemingly headed for a ho-hum ending and what does this all mean for lottery positioning. And an hour or so later it just seemed oh-so-long-ago when Porter made a three-pointer on a LaVine assist with 4:51 left in what seemed like it should have been the game. That was just before the hustle board overheated when Wayne Selden dove to get a loose ball away from Carter and got the ball to LaVine for a fast break layup and 116-110 Bulls lead with 4:27 left in regulation. It appeared the Bulls had saved themselves from embarrassment after that big early fourth quarter lead. But then the Hawks ripped off 11 straight points and Young’s long pullup three over Dunn with 3.3 seconds left for a 124-121 lead looked like a winner, Young with 18 points in the fourth. But these days for the Bulls they don’t get to zero/zero too often without their double O, Otto. With 2.2 seconds left, Porter got an inbounds pass, went up for the tie and was fouled! Three shots. Are you kidding me, Dewayne Dedmon. Mon, you would be dead if this one mattered all that much. Porter calmly made all three free throws with four tenths of a second left in regulation for the tie, He and Markkanen combining for 21 fourth quarter points. Overtime No. 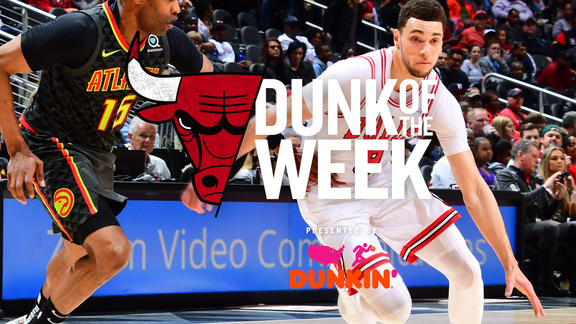 1: It was the Zach-a-palooza with the Bulls scoring machine going shot for shot with the Hawks superb rookie (that draft day trade with Dallas doesn’t look so one sided anymore with the Hawks getting the Dallas draft pick this year and their own, which could be Zionesque). Both scored 11 points in the first overtime with Young getting it going with a three, Zach matching and then adding eight straight Bulls points, a slashing drive, a spinning drive, a quick catch and shoot three until it was Young going all the way down the right side for a layup to tie at 140 with one second left. Young is on a wild run averaging 34.8 points the last five games while LaVine in that same stretch is averaging 30.4 points with two of his last four games at least 42 points. Overtime No. 2: Fatigue starting to set in. The Hawks were getting the boards again, a pair of offensive rebounds leading to an Alex Len tip-in and 147-142 Hawks lead with 2:25 left. Seemed like an ideal close for the Bulls, competitive game with thrills and a loss to probably lock up that fourth poorest record. But not for LaVine, who came flying down the lane for a huge, arm-extended slam dunk that seemed to stun the Hawks. They would not score the rest of the quarter as Len gagged a pair of free throws. LaVine missed a pair of jumpers before driving across the lane, seeing the defense collapse and never hesitating on the corner pass to Arcidiacono with 25.1 seconds left. Who went back to Villanova days with the tie at 147. The Bulls would get one more chance with 3.8 seconds left after a Carter miss. What the heck was he still doing out there? Talk about elderly abuse. Porter drove right and may have been fouled with a tick left. But he wasn’t getting a second call after the three free throws. “Right now we definitely are learning to play the right way, play with each other and learn from this so we can start something fresh coming into next year,” said Porter. Overtime No. 3: Zach was back, the only Bulls starter to score in the five-minute session, scoring six of the team’s eight points and the last six. Again the Hawks took the lead, 152-149 with 2:51 left on a Len layup from Young. The Hawks kept drawing Markkanen into switches onto Young, and Markkanen mostly did good work staying in front of the crafty Young. But LaVine makes the most difficult shots, rivaling the kind of scores converted by players like James Harden, Kevin Durant and Steph Curry. So LaVine rose up from a flat footed stance to drop a three over Deandre Bembry, who didn’t react because it seemed no way with LaVine pinned in the corner he could even get off that shot. So 152-152 with 1:56 left. Carter finally made a three for a 155-152 lead, but LaVine drove and was fouled, making one of two. And then after Young missed, LaVine banked in a tough drive with 1:06 left to again tie the game, this time at 155. Anyone looking for 400 points? That late into the game to have the quickness to blow by the defense is remarkable. One of those dumb ones was LaVine airmailing a 20 footer with 7.5 seconds left, then Harrison harassing Young into stepping out of bounds with the dribble, and then LaVine fumbling the inbounds pass and running over Carter for a charge as everyone seemed to be looking for the oxygen. “Airmailed one because I was so tired,” LaVine admitted. “We made a couple of weird plays.” Both sides. Overtime No. 4: Winnin’ time? Again, the Hawks took the lead on, of all things, a Len three. But hang time Lauri answered with a driving score and Lopez tied the game with a slam dunk as Porter drew the defense and passed. It was 159-159 with 2:40 left. 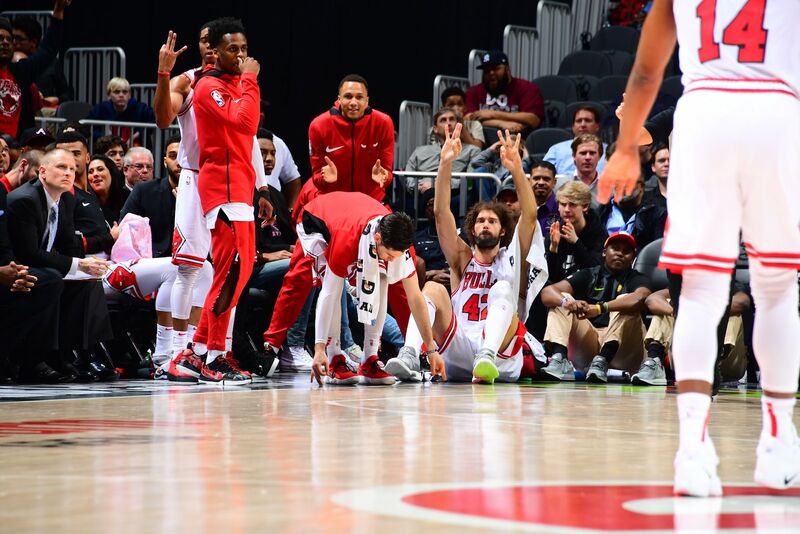 The Hawks didn’t start Young in the fourth overtime to give him rest, and Bulls players said they kept marveling about Carter “I was talking to him, saying, ‘How the heck are you still out here?’” said Porter. “He was like, ‘I don’t even know.’ I think he said his legs were numb; he couldn’t feel them.” Len then fouled Markkanen on a long three, the dumb three-point foul a crucial Bulls weapon. 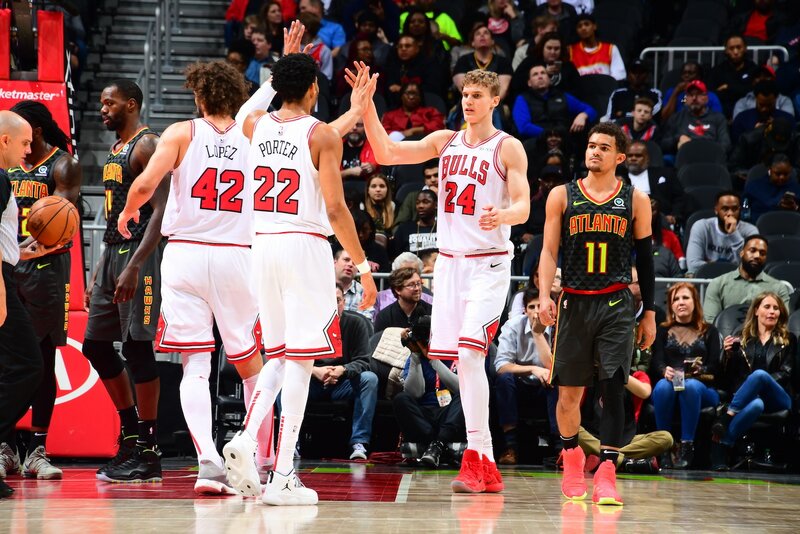 Markkanen made all three free throws, the Hawks missed and Lopez followed in a Porter driving miss for a 164-159 Bulls lead with 1:28 left. You don’t get to say that often. There was a last Hawks gasp with a Young driving score and Porter miss. But Carter missed a three and LaVine took off, weaving left and right and then taking a bump, falling and putting in a layup for a 166-161 Bulls lead with 37.1 seconds left. One more Hawks miss and it would be as close to the playoffs as the Bulls would be this season. The intense and relentless Friday game would be followed by a playoff-like schedule of travel and then a Sunday game between the same opponents, 2:30 in the United Center. Maybe next year. They certainly now seem good enough to dream.